Everyone has heard that it’s important to start saving for retirement as early as possible. That’s great advice. However, many people simply didn’t have the choice or the opportunities to invest for retirement in their youth. Many had to sacrifice their retirement savings to climb out of debt. No matter the circumstances, investing late in life can still be a way to secure a financially safe retirement. This article is a continuation of Investing for retirement. It will offer advice to those for whom retirement is nearing fast. Investing late in life is highly dependent on the time left until the investor’s retirement. The less time is left until retirement, the higher the share of investments should be allocated to conservative venues (bonds, ETFs). Even if a future retiree has saved only $50,000 to $99,000, he or she would fall into a very distinguished group (7.1%) of baby boomers. More baby boomers have zero retirement savings (28%). 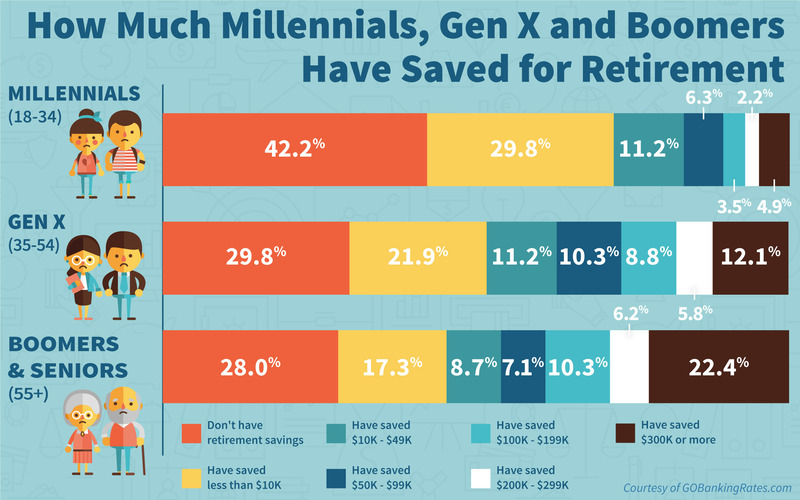 The most jarring fact is that the decrease in the share of people who have saved up $0 for their retirement from generation X to baby boomers is just 1.9%. Some people may start investing when they have just 15 or 10 years left until their retirement. That is still better than having no savings at all, which is a reality of over a quarter of the 55 and older population. Investing late in life is really important for those who don’t have enough savings. Also, for those who feel like their spending may increase in the future. Health care costs are the ones that increase significantly during retirement. No one would want to face financial uncertainty because of them. Higher spending on other costs during retirement, like wellness and lifestyle is also a reason why investing late in life is so important. These costs are almost inescapable, and few retirees are willing to experience a shift to a more thrifty lifestyle. Investing late in life also functions as a safeguard against poverty in case of losing a job. Ageism in the workplace still exists, and older employees are often the targets in their workplaces. Investing has long been used as a safety precaution against harder times, and investing late in life can help financially cope with losing a job. For people who have 20 years left until retirement, investing late in life will be a mix of traditional investments and investments for retirement. 20 years is a long enough period to be able to afford to invest both for retirement and for any other needs. Investing late in life is mostly about managing risk. To a lesser extent, it is also about securing a financially safe future. Investing for retirement discussed the most and least risky investment types and savings strategies for retirement. What if I already have enough investments and savings? People who already feel on track with their investments and savings, and have around 20 years left until retirement are in a great place. The most important task for people with 20 years left until retirement is not losing their main income source. Keeping their salary at the same level is also a priority. 20 years until retirement is around the time when employees reach the peak of their earnings. Earning the highest salary for as long as possible, is the most important task for workers who have already taken care of their savings. Higher earnings directly correlate with larger savings and investments. And the more a person saves and invests, the more they can expect to feel financially safe during their retirement. Sadly, employees are often let go when they are in the peak of their careers. Ageism exists in societies all over the world. Young workers with “fresh” ideas are seen as a better choice compared to older workers. One person can’t change this injustice, and all people eventually will have to feel the effects of it. The best course of action is always keeping up to date with new ideas and methods in the workplace. If there are signs that an older worker is going to end up being replaced by a younger one, the best thing to do is to tap into the network of friends, acquaintance’s and family. That’s the advantage that older workers have. It’s an advantage which can be used to secure a job even in an older age. 20 years until retirement is the milestone when future retirees should re-evaluate their investment and savings strategies for one final time. Two decades until retirement is a period of time which allows for a gradual movement of investments. Investments should be transferred from high and mid-risk investments into low-risk ones. While retirement may seem nearing quickly at this age, abandoning high risk investments should not be done all at once. This period is still enough far away from retirement. An ideal mix of investments for someone investing late in life (two decades until retirement) would be 60% of conservative investments and 40% high and mid-risk investments. This would allow to capitalize on the profits from high risk investments, while also having a safe backup if something goes wrong. The best opportunity for those investing late in life, could be investing in real estate. Both commercial and residential real estate investments have lower risks than investing in stocks or financial derivatives. People with 20 years left until retirement often have a large nest egg saved up, and are looking for investments with medium risks and medium to high returns. Real estate, in this case, becomes the perfect investment for them. Commercial real estate investments are riskier than residential real estate investments. Yet, they also offer higher returns. Thus, choosing the right investment depends on the reward the investor is seeking. What if I don’t have enough investments and savings? Life happens, and some people just don’t start investing and saving until late in their life. However, it’s still better to start later than never at all. Contrary to those who already have saved up enough money, those who don’t have low savings, should focus on high to medium risk investments. 60% of their investment portfolio should be dedicated to them, and 40% to low risk ones. High risk investments that many future retirees choose to invest in, are stocks and higher-risk ETFs. Dedicating 70% of high risk segment of an investment portfolio to a mix of dividend and growth stocks, could be a way to acquire wealth before retirement. An experienced investment advisor would be the right choice for people investing late in life, and looking for the right stocks and ETFs to invest in. The low risk segment of the financial portfolio is best dedicated to medium risk bonds, index funds, and low risk ETFs. The high diversification of the low risk segment is a great insurance. It protects against the effects of price fluctuations of the individual assets. Cutting liabilities is important for those who do not have invested enough late in life. Directly cutting back on unnecessary expenses, like video streaming services or premium memberships, will help to invest late in life. The money that would’ve been spent on various liabilities now can be invested into assets. This tactic is great for minimizing expenses and maximizing wealth building. Not all liabilities impede wealth growth, and some can even contribute positively to it. Two decades until retirement is enough time to move into a more financially rewarding career or a job position. This is really important for those who feel like they don’t have enough savings for their retirement. Hence, it’s really important to strive for a higher salary, in case of a low amount of investments for retirement. For those who have 10 years left until retirement, investing should consist of a majority of retirement investing and a minority of wealth building. Using this structure will help future retirees prepare for the oncoming retirement without significant risks. Investing late in life, when a future retiree has a decade left until retirement, should be focused on low risk investments. The Pareto principle fits this situation the best: 80% of investments should be focused on retirement, and 20% on wealth building. For additional safety, the 20% should be mostly composed of medium risk investments, instead of high risk ones. This additional precaution balances wealth building with a risk-averse outlook. Wealth building can be important even if a person has only a decade left until retirement. However, it should not be the main focus. Wealth building may be important to people who have children and grandchildren, and are willing to pass on their wealth. It can also be important if a person wants to donate to charity. Yet, wealth building should not be a priority for people close to their retirement. Because medium risk investments have significant risks, it’s better to focus on low risk investments, rather than wealth building. A more rational decision is foregoing larger wealth, instead of risking a financially safe retirement. The investments for retirement, when the investor has 10 years left until retirement, should be focused on conservative areas. A lot can change in decade (no one was thinking in 1998 that in a decade there would be a financial crisis), and no is safe from the repercussions of economic crises. High risk investments were hurt the most during the 2008 crash. That’s why it’s important to focus on low risk investments. The low risk investments which are perfect for investing late in life are low-risk bonds, index funds and mutual funds. Low and high risk investments. Source: https://www.youinvest.co.uk/sites/default/files/riskChart-1.png. As many countries offer early retirement opportunities, those who invest late in life, should not be very worried about losing their job. Even if the worst happens, early retirement could be a way to improve a bad financial situation. A decade until retirement is a long enough time to build a small nest egg of investments. Focusing on medium return investments should be the path towards a comfortable retirement. Investing in medium to high risk ETFs, blue chip stocks, and a selection of higher return bonds should, in a decade, create enough savings for retirement. 10 years is also enough time to radically cut back on expenses and liabilities. The money that would have been spent on vacations and restaurants, should be invested. This will allow for more money to be invested late in life, and more money to be saved. Because it’s possible to re-invest gains, the initial investment can grow significantly in a decade. Budgeting and making smart purchases will also allow to minimize expenses, and to maximize asset growth. For those who have 5 years left until retirement, investing should consist of only very low risk investments. Or better yet, some investments can be cashed out. Studies have found out that the fewer times an investment portfolio is changed, the better it performs. There is a high probability that the same is true for an investment portfolio that is managed late in life. Hence, unless there have been massive changes in the assets of a future retiree, there are no reasons to change them drastically. Completely focusing on low risk investments should be the best bet against volatility in the markets. Although pulling out investments won’t let the investor capitalize on the potential of gains, in some cases, pulling out investments can be the right choice. If there is a significant probability of a recession, investments that aren’t recession-proof, should probably be cashed out. The risk of losing a large portion of them to inflation and unpredictable volatility is too great. Moreover, the rewards of keeping the investments in the market don’t overcome the potential risks. It is assumed that the person who has 5 years left until retirement will at least have a guaranteed state pension. The guaranteed state pension should keep the retiree above the poverty level. Not having enough investments and savings would just lead to a scarcer retirement. If the future retiree feels like he or she does not have enough investments 5 years before retirement, there are ways to significantly increase them before retirement. One way is to make a last shot at a promotion. A €500 raise over 5 years will translate into additional €30,000 earned over 5 years. If those €30,000 would be invested into medium gain investments (5% gain per year), they would bring a €1,500 profit per year, every year! That profit is almost equal to one month’s average wage in Europe. Not a bad effect for asking for a raise. Another way of growing savings and investments 5 years before retirement, is searching for a better job through friends or family members. Family members are usually more sympathetic to the problems of their relatives. Thus, it might be possible to find a better paying job even 5 years before retirement. And a higher salary directly translates into higher savings and investments. If it’s impossible to receive a larger salary, it could be tempting to start investing into high risk investments. Choosing high risk investments could seem like a right choice. Especially, in the case of a person who is facing retirement with low investments. However, high risk investments literally mean that there is a high risk of losing all of the investment. What’s better: starting retirement with modest savings, or no savings at all? Hence, for people investing late in life with not enough savings, low risk investments are a far better avenue than high risk ones. The returns will be lower, but at least they are far more likely to come. If a future retiree has zero savings and investments 5 years until retirement, they have to take immediate action. The first step is reaching out to immediate family and informing them that they will require financial help during their retirement. The financial help can be provided in exchange for help around the house, nanny work or teaching. The next step is looking into government programmes for poor elderly people. Food banks and welfare should be researched. It’s important to know for which programmes the retiree will be eligible, and construct a budget with them in mind. These options may be unavailable for some people. In this case, the best course of action is moving into a less developed country for the retirement. The money a retiree has will “go on for longer” in a less developed country. This might help to have a financially safe retirement. Investing late in life. Copyright: Money Bear Club. It may seem like investing a €1,000 or €10,000 late in life won’t change anything. Yet, because of the combination of possible gains and compounding gains, investing even small sums can create nice profits. A steady and a calm approach to investing late in life, will give the best opportunity for a financially safe retirement. Disclaimer: this article should not be taken as financial advice. Any financial risk a person assumes is only his or her own.